Decide how ambitious you want to get with your vegetable garden. No matter what size you decide to make it, be sure you choose a location that gets at least six hours of sunlight – the more the better. 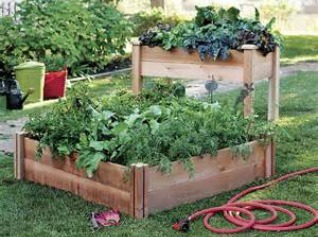 Consider whether you want to grow vegetables in the ground, raised beds, containers or a combination. If you plant seeds, you’ll find instructions for spacing and planting depth on the packets. Remember that seeds take longer than starter plants to produce vegetables. Some seeds are best started indoors up to 6-8 weeks before your last frost date. Soil provides the nutrients your vegetable plants need to thrive. To make sure your soil is right for your new plants, perform a test with an affordable kit from your local home improvement store, or provide a soil sample to your local extension service. Enrich your soil if necessary by adding compost or garden soil, such as Miracle Gro Moisture Control or Dr. Earth Organic Planting Mix. Work a 3-inch layer into the top 6 inches of your soil using a hoe or a tiller. Remember to pick up rocks and remove any weeds. Also, check how well your soil drains by observing it after it rains: do puddles appear on the surface? If so, the drainage is not so good and you may want to plant in raised beds instead. With vegetables, timing is everything. Broccoli, carrots, lettuce, peas, and spinach like cool weather. So, you can plant them in early spring before the last expected frost. 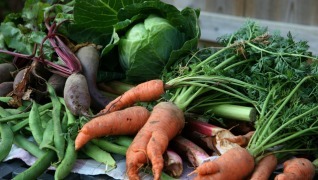 Many cool weather vegetables can be planted again in late summer for a fall or winter harvest. After the last frost date, when the soil has warmed, plant your warm-weather vegetables, like corn, tomatoes, cucumbers, and peppers. 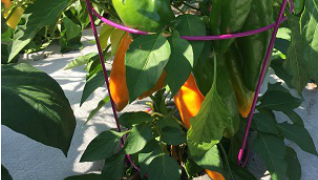 Herbein’s Garden Center has a huge selection of vegetables and herbs in both organic and non-organic with over 40 types of tomato plants alone! Be sure to plant your vegetables or herbs as deep as the pots they are in with loosened soil around their root systems. Once your vegetable garden is planted, your plants will need regular watering and feeding. It’s best to water in the morning, which allows plants to dry by nighttime to help prevent disease. Your vegetables’ needs will vary; some, like eggplants and peppers, are heavier feeders than others. About a month after planting, start feeding your plants with a water soluble plant food, like Miracle Gro Tomato Plant Food every one to two weeks. Last but not least…WEED CONTROL. Weeds compete with your vegetables, stealing nutrients, water and sunlight, so be sure to keep them out while your vegetables grow. You can apply a 3-inch layer of mulch around your plants to help discourage weeds by blocking growth and access to sunlight. Mulch also helps retain soil moisture and improve the aesthetics of your vegetable garden. With all the tips I’ve listed, I hope you have a successful garden and a bountiful harvest this year.